The promise of free two-day shipping and access to the Kindle Lending Library were the lures that got me to nibble an Amazon Prime subscription deal I was offered a couple of years ago. At the time, I paid $59. Last year I paid $79 for the same privilege. And now Amazon has announced that the new annual fee for Amazon Prime will be $99 starting in April 2014. I wouldn’t be a cheapskate if I didn’t admit that the price increase is a major factor in why I’m rethinking my Amazon Prime subscription. It’s a lot of money for this thrifty family of 5. We cannot stream free videos from Amazon. I live in a rural area and my only option for internet is expensive satellite internet. I pay an outrageous $135 a month for 25GB of bandwidth. Between the work I do for the blog, my husband’s career and projects, and the kids, we always exceed our bandwidth (Which means we get really slow internet until the month resets). We simply can’t stream more than a few short YouTube videos each month if we want to be able to do our actual work. Free streaming movies and television shows are one of the awesome perks of being an Amazon Prime member. Unfortunately, it’s a perk that we cannot access. The Kindle Lending Library isn’t that good. As a Kindle owner, I was very excited to see that with my Amazon Prime membership I could borrow one book each month from the Kindle Lending Library. While there are hundreds of thousands of titles to choose from, most of the titles are 32-page e-books written by bloggers. Anything that I had my heart set on reading, isn’t in the Kindle Lending Library. Amazon has added Kindle First, which allows you to pick one book from four brand new Kindle titles each month to keep. It’s a nice gesture, but the genres don’t always appeal to a wide audience. The 2-day free shipping isn’t always 2-day shipping. Over the past year, I have encountered several instances in which I was assured that the item qualified for 2-day free shipping, only to be notified on the day that it was expected to arrive that it had been delayed for one reason or another. It is frustrating to be told to wait, when you’ve been promised immediacy. I have also found that there are many items that don’t qualify for the free 2-day shipping. The 2-day free shipping isn’t really free (for me). I live in a rural area. That means, if something is sent to me by the USPS, and that package doesn’t fit in my mail box, the postal carrier won’t deliver it to my home. When that happens, I have to make a 14-mile trip (28 miles total) to town to pick up my package at the post office. When I first signed up for Amazon Prime, the biggest perk was that, UPS would deliver my order directly to my door (in 2 days!). No more spending money on gas and wasting time driving to the post office to pick up packages! But then… Amazon made some changes… Some of my “Subscribe and Save” orders started being sent by USPS (so back to the post office for those). And then, there came an arrangement in which UPS only delivered the package to my post office, not to my home like they used to do. So I’ve had to make more trips to the post office again. If Amazon won’t deliver my orders to my door, it’s not saving me any money to use Amazon Prime for this reason. I’m not shopping at Amazon as much as I used to. The past holiday season really frustrated me. My family and I suffered through orders that were delayed or cancelled altogether. And the changes in the way things were shipped were frustrating, too. And then I noticed that Amazon didn’t have the lowest prices anymore. In fact, I saw them frequently jacking the prices on things, only to announce a big sale in which the prices were down 70% or more. The large percent drop made it seem like a great deal, but a little shopping around proved the prices were still higher than what I would pay elsewhere. I’m also not shopping at Amazon as much because it was too tempting to buy what I wanted without giving it much thought. I’m trying to reduce the amount of clutter in my home, so that I can save more money. Too much browsing the Amazon deals was to detrimental to my budget. 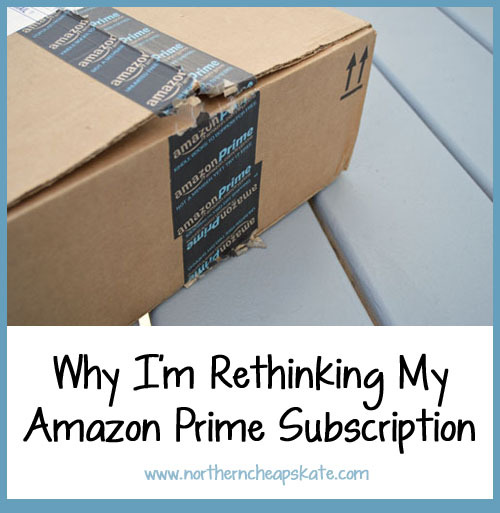 My current subscription to Amazon Prime isn’t up for a few more months, so I do have some more time to think about whether or not I’ll renew. But based on all of the things I’ve mentioned already, I don’t think I will be doing that. The key to evaluating whether something is a good deal is to take a close look at whether it is of value to you. And I’m not sure that Amazon Prime is as great a value to me as it once was. What do you think? Do you have Amazon Prime? Do you think it’s still worth it at the increased price? I can see why you are re-thinking this. I can stream and we do that often and it helps keep the hubby from asking for Netflix. LOL! I don’t have the delivery issue either, but I can see how it would be annoying to have to drive 14 miles to get your item you technically paid for delivery. Mine isn’t up until next December, but I should probably look at how many orders we placed during that time and if it makes sense. I don’t usually use the lending library since nothing I want to read is a free one. It’s funny you post this today because I was just having a conversation with friends last night about how Amazon isn’t as attractive as it used to be, and how we don’t shop there nearly as often anymore. And I don’t even have Prime or the issues you mentioned (the amount you pay for internet is shocking to me – I pay less for 150GB!). I find that their advertised two day shipping is anything but. Once they bring the postal service (USPS) into the process, it NEVER arrives in two days. I also dislike the fact that many times the shipping method is not specified. If I know that the USPS service is involved, I usually won’t order. I only live about 2 miles from the post office but it takes them two days to get it to my house after they receive it. Totally unacceptable. I won’t pay for PRIME either. I tried a free month, ordered one thing that did not arrive in time (see above) for a party. Not worth my money. Has anyone who has mentioned not receiving items in 2 days called Amazon to complain? I did, and got a free one-month extension, and the rep said she would place a note on my account. The next order did come in 2 days, but I’m waiting to see if the problem is really resolved or not. The issue for me seemed to be with movies. For some reason they would send those Fedex Smartpost, which meant USPS and 3 day delivery. I’m hoping that since I complained they won’t do that anymore and I’ll get my orders in time. We do stream quite a bit and live in an area where it’s hard to get a lot of things, so use the shipping quite a bit. The movies are the only items that seem to take more than 2 days. If I were in your situation, Christina, I wouldn’t renew. I did this, and got the 1 month extension. They said my 2 day shipping was “estimated” and I had to remind them that I paid for guaranteed 2 day shipping. I get things within 2 days (sometimes 1!) on most occasions. I love ShopRunner as an alternative to Amazon Prime. They have free two day shipping and tons of brands. They’re also offering all Prime members a year of their service free! The link is: http://www.shoprunner.com/amazon-prime. My adult daughter lives about a mile from me so we decided to split the cost of Amazon Prime. She put her credit card on my account and when she buys something she just pays with her card and has it sent to my house. It’s working out so far. My only worry is that she’s legally blind and I’m praying she doesn’t make a late night mistake and accidentally use the wrong payment. But so far so good, and it sure makes the cost seem more worthwhile. If I were able to split the cost, I might reconsider it. But the full cost seems a bit much when you don’t use all the services.